Island Ventures is on the constant lookout for enthusiastic and committed boat crews to join our team. We have a constant and busy schedule running 2 Island Hopper boats. Actively recruiting for Captains, 1st Mates and Dive Instructors to help run our busy schedule. We are looking for Captains who have experience running dive and snorkel boats. We are very flexible and you would be able to work hours that suited you. Enthusiastic and committed to providing excellent customer service. A sound knowledge of the local Key Largo reefs and wrecks is very important too. Instructors will run all Padi core training courses from Discover SCUBA Diving through to Dive Master. 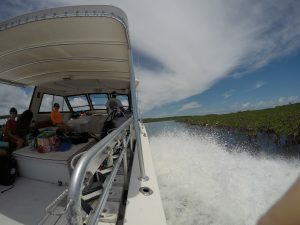 2 Island Hopper boats – must have a sound knowledge of running as first mate on the Key Largo reefs and wrecks. Must have a practical knowledge of running boats. Boat Crews must be part of the Keys Consortium drug testing program or equivalent and be willing to undertake a background check for working with children. If you have the skills and are looking for opportunity to join us, please send your Resume to dive@www.islandventure.com, and we will contact you for a chat!